Relaxing with that glass of red wine quickly turns to feeling stressed when the wine hits carpet. 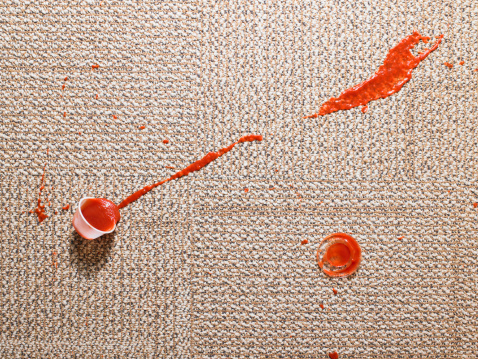 The dark color stands out, especially on light-colored carpet, but with quick thinking and a few items you likely already have, you can remove the stain. As soon as the wine hits the carpet -- Berber or plush -- reach for a clean, white absorbent cloth. Blot the stain repeatedly to absorb as much of the liquid as possible. If the red wine stain has already set, skip the initial blotting step and move on to other cleaning methods. When water alone doesn't remove all of the red wine, or when the stain is already dry, reach for household items that help. Baking soda, dishwashing detergent and vinegar in particular may work on red wine. Mix 3 parts baking soda to 1 part water to make a paste. Put the baking soda paste on the red wine stain. Let the paste dry. Vacuum up the dried baking soda paste. Add 1 tablespoon each of vinegar and dishwashing detergent to 2 cups of water. Stir the mixture. Dab the dampened cloth on the red wine stain. Continue dabbing with clean parts of the cloth until the wine stain is gone. Blot the area with a clean cloth dipped in clean, fresh water to rinse out any remaining vinegar and detergent. Blot the area with a dry cloth to remove excess moisture. For especially difficult stains, a combination of dishwashing detergent and hydrogen peroxide is an option. This method is particularly important to test in a hidden spot, as it could discolor the carpet. Combine 2 parts hydrogen peroxide with 1 part dishwashing detergent. Rub the mixture into the carpet with a cloth or sponge. Blot the spot with clean water to remove the mixture from the carpet. Some commercial stain removers and carpet cleaning products, such as OxiClean, may work on the red wine stain. Leave the cleaner on for up to 5 minutes, not allowing the area to dry. Blot the area with clean water and a clean cloth. Move furniture to cover the spot if the placement doesn't affect the flow of the room. Purchase a new piece of furniture, such as a small table, if it works in the location of the stain. Cover the wine stain with an area rug.